One of our favourite outings in Istanbul during our Turkish Aromatic Odyssey is visiting the Spice Bazaar near the shores of the Golden Horn. 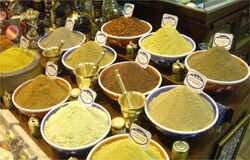 Spices from all parts of the Ottoman empire and beyond have been traded here since its construction in 1660 along with extensions to the nearby mosques. Stall after colourful stall containing all manner of exotic aromas from the spices, herbs, teas, seeds, nuts, Turkish delight scented with rose, lemon or pistachio, saffron and caviar greet us. In the outer section there are even more stalls filled to the brim with all manner of household goods. Above many of the stalls you will see the word Baharat emblazoned in large letters. Baharat means "flowers and seeds" or more loosely translated as "herbs and spices". It is also the name given to the typical blend of aromatic spices used widely in the Middle East. Traditionally the Baharat spice blend is added to recipes along with other sweet, pungent, hot and freshly ground spices. A typical Baharat will contain black peppercorns, cumin seeds, coriander seeds, cinnamon or cassia, cloves, cardamom, paprika and nutmeg.